The garden has produced some lovely zucchini this summer. Some of them are as long as my forearm and are bigger around. (It's true that I have skinny arms, but this shouldn't diminish the ample girth of my beautiful zucchinis! They are whoppers!) I've braised, broiled, boiled, blanched, roasted, sauteed, stir-fried and even stuffed them. But I haven't made zucchini bread yet. That is, until now. Unfortunately, my kitchen saw a casualty this evening while preparing the zucchini bread. My beloved hand-mixer beat its last egg. Apparently the recipe I used is a "spatula only" recipe, because at one point the batter got so thick and gummy that the beaters refused to spin. And with a spark and smelly black smoke, that was the end of Sir Mix-a-lot. Luckily it wasn't a fancy brand and can be inexpensively and easily replaced. The bread itself turned out wonderfully! I did make a few changes to the recipe. Instead of using grated un-peeled zucchini, I used peeled zucchini. (I had it in the fridge and didn't want it to go to waste.) My loaves came out a little lighter in color than they normally would have been if the skins had been included. I was also running low on walnuts, so I substituted half the portion with toasted pecans. The difference is subtle, but pleasant. I also added some golden raisins and sweetened coconut flakes. These two additions remind me of the holiday loaves my mom used to bake when we were little. She'd turn the kitchen into a factory and bake dozens of loaves. We'd eat it for breakfast, carry it in our lunches, have it as an after-school snack, eat it for dessert AND we'd spread the love by giving it away as gifts. I remember those aluminum foil-covered bricks fondly. I found the consistency of my loaves nice and dense (the way I like them), while maintaining a satisfying moistness. I can't wait to toast this in the morning for breakfast and smear some butter and cream cheese all over the hearty slices. I've been thinking of different ways to change up the self-portraits. I want to get away from the mold of snapping a picture of me wearing a tank top out on the porch with my flowers behind me. Although that most certainly captures a slice of my life, I want to infuse the portraits with more. Ideally, I'd like to go back to painting them, but at the moment there's simply not enough time for me to tackle that again. 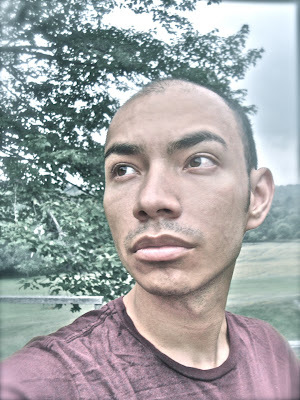 Here is my first attempt at bringing new life to the self-portraits. The night before, I had a dream of flying through saffron colored clouds and over golden fields of wheat. As I flew, I could feel myself dissolving into a gilded amorphousness, my bones and flesh melting into a shimmering ether. My face wasn't my face anymore. My voice had become the whistling of wind and I felt completely and totally weightless. I was warmth. I was light. I was everything and nothing in that very instant. 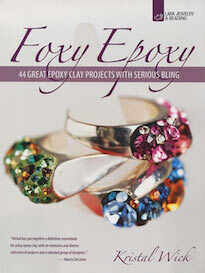 To celebrate the four year anniversary of the blog, this week one lucky winner will claim the bead hoard shown below. The prize consists of dyed bone strands and shell chain from Bead Trust, artisan lampwork beads by Maria Richmond of Lost Marbles Lampwork, Tim Holahan of Fire Garden Glass, Stephanie Maddalena, Donna Johnson of Dancing Light Jewelry and Valerie Logan of Gray Parrot Glass, Czech glass from Talisman Associates Inc., chunky African glass beads from a shop in New York City, ceramics from Keith O'Connor and Peru, natural brass from Vintaj, carved stone by Dean Crane of Two Cranes, a rose gold plated aspen leaf, carved stone Chinese zodiac symbols, resin-encased bamboo from Priscilla Marban, enameled Mexican silver, a silver ring with a set pearl, and two bracelets (one with turquoise and coral and the other with color and mother of pearl). Made by me are polymer clay components, bronze clay links, and some one-of-a-kind shrink plastic components. This is a treasure trove of beads! To enter to win this bountiful bead stash is easy! All you have to do is comment on this blog post. One lucky winner will be randomly selected from the comment section of this blog post on Monday, (August 2nd) at midnight EST. Make sure to leave your name if it doesn't already appear next to your comment for easy verification. This giveaway is open to all participants, including international readers. Bonus Points: You can earn extra chances to win by blogging about, updating your Facebook page, and/or Twittering about this Thursday Giveaway. Don't forget to add you act of social media kindness as an additional comment for your extra entry and chance to win! Extra Bonus Points: Become a follower of this blog and leave a comment here afterwards. Becoming a follower is simple. Find the widget on the sidebar to the right and click, "Follow". Don't forget to add an additional comment for your extra shot at this HUGE bead stash! For dinner last night, I prepared braised cucumbers, sauteed beet greens with caramelized onions and roasted garlic and panko breadcrumb-crusted chicken breasts. (On the side and not shown above was a salad with a raspberry vinaigrette.) I've really been enjoying cooking with all the fresh vegetables from the garden. It has done a lot to expand my culinary horizons. I've had to be creative in my usage of all the vegetables, so they don't go to waste. It's forced me to learn lots of new recipes and prepare dishes that I've never attempted before. I collect succulents. They remind me of the desert. I was born in the desert. I was too young to experience it then, but it is in my blood. Whenever I go back, I bring a little bit of the desert back with me. I got this Echeveria shaviana on my last trip to Tucson. I was pleasantly surprised to see it in bloom today. I love the clusters of pod-like, pale-pink buds dusted with an imperceptible grey shimmer. Look what came in the post last week! It's a cute little speckled, hand-built ceramic shot glass from Lori Phillips Ceramics. I love the organic edges and earthy colors. She's got a lot of interesting vessels in unique glazes available. I first became aware of Lori's work on Lorelei's blog. I sometimes like to imagine that I'll be a minimalist and have no possessions. But let's face it... it's never going to happen! I'm a magpie to my very core and I come from a powerful bloodline of hoarders. No need to fight my own nature. I think one day I'd like to get rid of all my Ikea tableware and replace it all with handmade items. I like the idea of living a life touched by artists on every level. They say to "stop and smell the roses" but I prefer something a little more unique. I took a little time today to take a breather out on the deck. I've been working pretty solid on getting everything ready for the update to the shop. I'll only be able to add a fraction of the new pieces. Even still, the preparation has been intensive. It was important to take a few moments to stop – just stop. It's so easy to get wrapped up in the details and in the minutiae of life, the stresses and frustrations and laundry lists. So I made a conscious effort to take a break today. 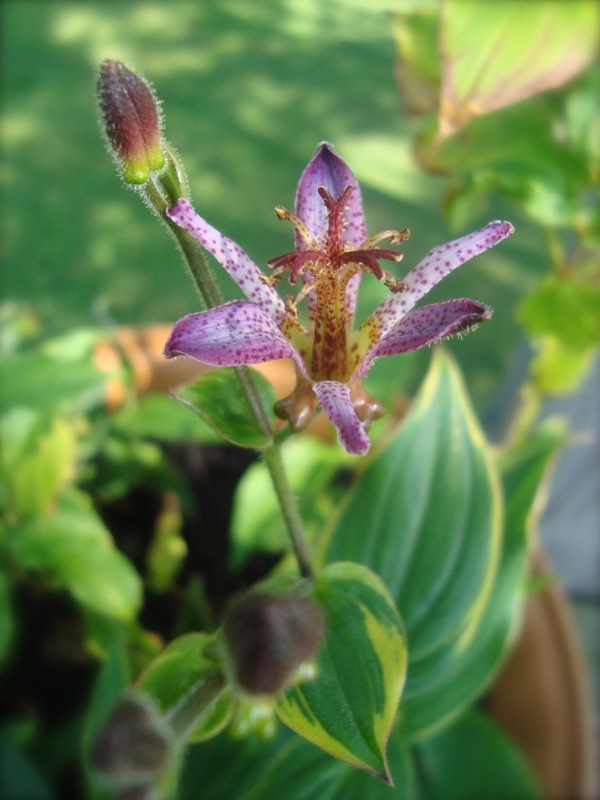 I noticed that one of my toad-lily plants was in bloom. I love the speckled and spotted flowers. They remind me of orchids with their petaled mouths. If I hadn't taken my break, I don't think I would have seen this first bloom. I'm learning the value of stopping. So, when I ambitiously said the shop update would launch "tomorrow", what I really meant to say was, "there's no way to get everything done by tomorrow, it won't be until at least 3PM on Wednesday!" Since I have a big mouth, I'll give you all a little perk to clear out more space in the shop with a 25% off sale. The sale only lasts 24 hours. You have until 3PM tomorrow (Wednesday) when the shop update finally debuts. Use coupon code "BIGMOUTH" to receive your discount! The winner for this past week's Thursday Giveaway is Egmont of Four Seasons In A Life. Congrats! Please email me with your contact information and I'll put your prize in the post. Be on the look out on Thursday for a special anniversary edition! It completely slipped my mind, but on the 16th of this month, the blog celebrated its four year anniversary. It's hard to believe that I've written on a near daily basis for the past four years... and more before that in different incarnations. I feel as though we should celebrate. Here is where I've shared my joy and sorrow. Here is where I've laughed and cried with frustration. Here is where I've lost and learned. At times you couldn't pull me away from the keyboard and pry my camera from my fingers. At other times, it was hard enough to muster the volition to write a few words. Thank you for all of you out there who continue to support the blog and continue to read. I know it's easy to be swept up by your own lives and other pressing matters... so I feel fortunate to have you here, to share this journey with me. To celebrate, this week I'll host the biggest Thursday Giveaway yet. I want to say THANK YOU! Perhaps tomorrow, after I do the update to my shop I'll give a sneak peak at the prize. I am bumbling around with frenetic energy, finishing up projects and meeting deadlines. I feel sort of like a wound up top, moving surely and forcefully around the table. I am catching up on projects that are long overdue and laying down the foundations for new ones. The update to my shop should occur tomorrow, if all goes well. I'll be adding over 50 new kinds of products. It's a massive feat. Each item has five pictures and each of those pictures have been edited in some form or fashion. That's over 250 pictures (plus the retakes)! Not to mention the descriptions for each. I made sure to take a few moments to sit out on the porch today and do nothing. The sky was beautifully raked with clouds and the brightest shades of blue. I know myself. If I keep up with the wild abandon of a too quick pace, eventually I'll crash just like that top spinning and warbling out of control before it stops. But... if cautiously guided, I can maintain the momentum and do everything that needs be done. I'm hoping for the latter. I had the pleasure of meeting Ken Elwell in the Denver International Airport on my way home from a show. We are both artists and passed the time before my flight departed talking about our favorite artists and which museums I should check out on my next visit. When I got home, I was greeted by a link to his work. His artwork trembles with an eager enthusiasm and radiates lively energy. Bold colors flare against a web of movement. The hard lines of graffiti-like sigils tumble across canvases and spear their way through serrated fields of color and swashes of liquid arabesques. Each brushstroke, splatter and spill betrays the hand behind it, the motions and the gestures that build the architecture of expression. If you're lucky enough to be in the Denver area, August 14th, please stop by the opening of Ken's latest efforts at The Bad Kittie Salon. The reception starts at 7PM. Mark your calendars and make your way there for a truly, visually exciting time! I hope that it's not this bad tomorrow. I've got a photo shoot scheduled with the delightful and very talented Jen Palmer of Aisling Photography and it's outside. I was thinking that I needed a more "summery" profile picture and this opportunity happened to spring up. I highly recommend Jen as a photographer. She's got a grace and humanity to her photographs. Also, I hear that she's only going to be in the area for a short time longer... so if you're in the area, book her while you can! Tonight for dinner I made roasted zucchini, "crock-pot pork" with sauteed onions and peppers, and kohlrabi au gratin. I got the recipe for the kohlrabi dish from Nicki from Germany. She left it in one of the comments on my post "Little Harvest". I think everything turned out tasty and I'm pleased with the recipe from Nicki. All of the vegetables were from the garden. The wine that I used in the kohlrabi dish, to cook the pork with and to make a sauce for the pork came from a local winery called Walnut Hill. The cats have "clubhouses" all over the house. Whether it's underneath a particular table, under an overturned basket, or in the midsts of boxes in my packing station, they've found little kitty sanctuaries. There's always been one thing in common: The respective clubhouse could always hold two. That is, up until now. I was putting away the Food Club (no pun intended) cream soda and tossed the box over. Paulo went to investigate, but was too big to fit in the opening. Babette seized the moment and darted inside. Of course, Paulo tried to squeeze in too, but with a batting paw, Babette informed him that this clubhouse was "girls only". One of the beautiful things about living here is the availability of gorgeous fresh food (without the necessity of selling off a kidney on the black market to pay for it either). I adore farmers' eggs. Everything they're in seems so much better. 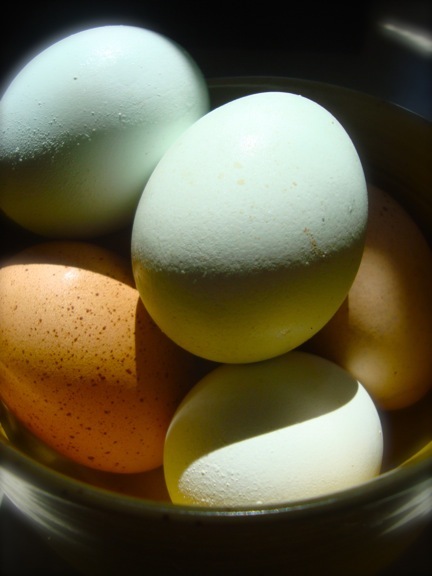 The yokes are richer and darker, the albumen is clearer, AND they come in fun colors like blue, green, and speckled brown. It makes me want chickens of my own one day! This week, one lucky winner will claim the prize of this gorgeous lampwork bead from Minnesota-based glass artisan, Susan Jones of Susan Jones Designs. Susan has painstakingly created this organic, ethereal-looking glass bead, which reminds me of the fantastical landscapes of Dr. Seuss, aquatic sea-life and the microcosms of cellular biology. Be sure to check out her gallery for more examples of her work. To enter to win this lovely lampwork glass bead is easy! 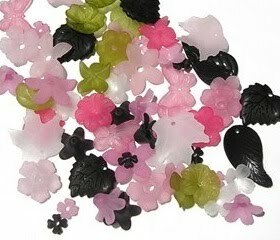 All you have to do is visit Susan's Etsy shop and comment on this blog post with the name of your FAVORITE bead from her Etsy shop. One lucky winner will be randomly selected from the comment section of this post on Monday (July 26th) at midnight EST. Make sure to leave your name if it doesn't already appear next to your comment for easy verification (and don't forget to say which of her beads is your FAVORITE). This giveaway is open to all participants, including international readers. Bonus Points: You can earn extra chances of winning this stunning lampwork glass bead by blogging, updating your Facebook page, and/or Twittering about this Thursday Giveaway. Don't forget to add your act of social media kindness as a SEPARATE comment to this blog post for your additional chance to win! I am now curating the next wave of Thursday Giveaways. 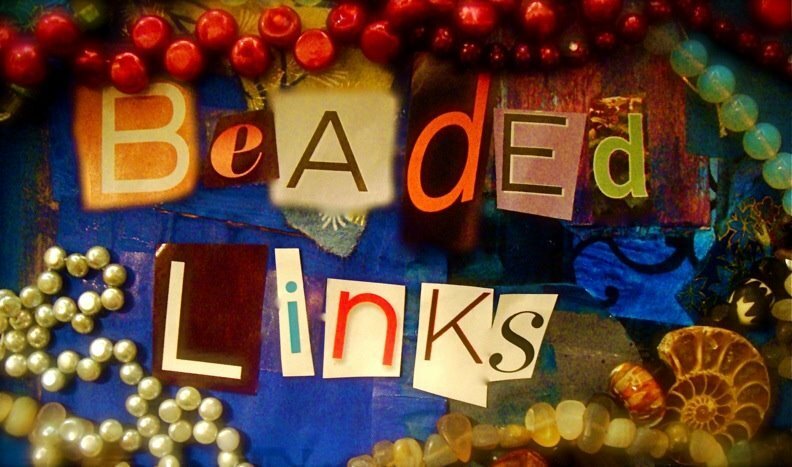 Each week I host a giveaway of art beads, jewelry-making paraphernalia or related items. The next available date is August 5th and the Thursdays after. If you'd like to be a sponsor and donate a prize to be given away, please email me and we'll schedule a booking for you. The Thursday Giveaways have been very popular and have generated significant traffic for past participants. This has proven to be very effective way to promote sales, product launches and reviews. If you're curious about more information, please email me. The Hole Bead Shop is hosting a giveaway! Up for grabs is $350 worth of lucite components! To enter to win is easy. All you have to do is purchase one of their Sampler packs between July 20th and August 15th. Each purchase counts as an entry. CLICK HERE for more details! Earlier this evening, the cats were acting strangely. They were meowing and trying to jump up on the kitchen sink (where they're not allowed). I was curious and investigated. That's when I saw a HUGE moth. 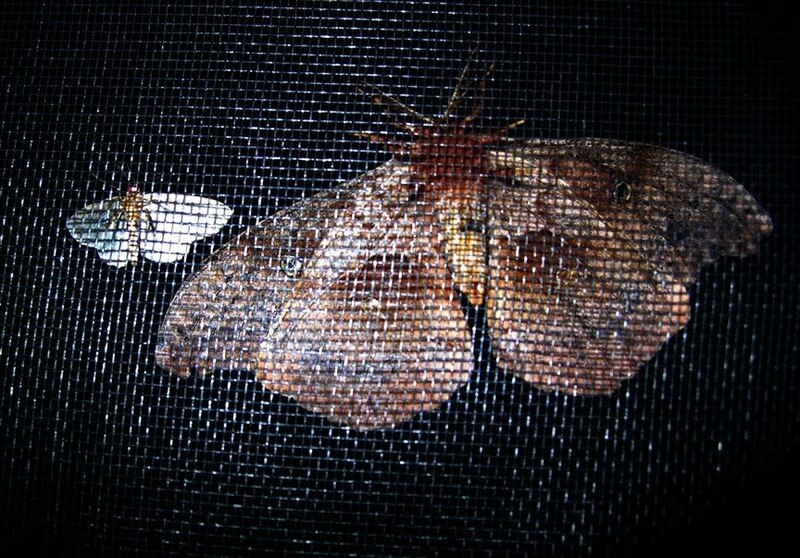 Above is a picture of the gargantuan night visitor. 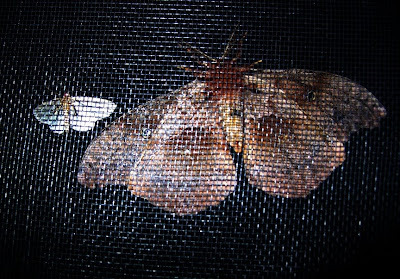 It dwarfs the moth next to it, which under normal circumstances and on any other night would be considered a fairly large moth. Lark Books is hosting a giveaway! 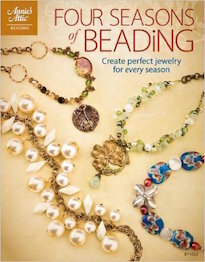 You can be entered to win signed copies of their current Beadweaving Master Class books by Diane Fitzgerald, Marcia DeCoster, and Laura McCabe. To enter to win, all you need to do is leave a comment on their post by 9 PM EST on Monday, July 26th. CLICK HERE to go to the post to leave your comment! The winner will be announced Wednesday, July 28th. The winner for this past week's Thursday Giveaway is Ramona of The Paper Princess. Congratulations! Please email me with your contact information and I'll put your prize in the post. Be on the look out on Thursday for another chance to win! For dinner tonight, I made Farfalle pasta tossed in a rich alfredo sauce. I used three different kinds of cheese in the sauce. With the pasta sprinkled with grated parmesan cheese, I made meatballs. My secret for tasty meatballs is using ground pork with ground beef. Depending upon the availability, I'll mix in other ground meats like bison or venison. I think the pork fat keeps the meatballs from drying out and the rendered fat makes a great starter for the sauce. The awesome thing about these meatballs is that they can be made in advance and frozen and kept for months on end. This is particularly handy if there's a sale on ground meat or if you're in the mood for mass meatball production. I don't like adding a bunch of filler, but do coat them in panko bread crumbs so that they're nice and crunchy on the outside. I like to bake them before freezing them and then frying them up in a skillet when I'm reheating them afterwards. This gives them a nice color and insures that they are crispy on the outside, but not dry. I'm almost certain that the locals think I'm a bit odd. On more than one occasion, I've been known to be seen pulled over on the side of the road examining flowers and pebbles. Today my white Jeep could be seen next to a ditch. I was in the ditch with my pocket knife, cutting the lacy fronds of the Daucus carota, also known as "Queen Anne's Lace" or "Wild Carrot". 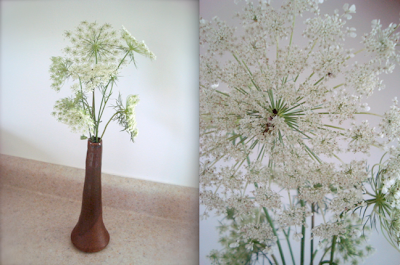 I love the sprigs of white flowers. I remember discovering that in between the pages of a big volume of Webster's Dictionary, my grandma had pressed these flowers. Time had bled the green from the stems and leaves, leaving them a dusty yellow color. The flowers were still white, but were tinged with that particular shade of yellow. I think before the summer is done, I might do the same. You might remember a couple of weeks ago, I hosted a giveaway featuring products in Alisa Masiejczyk's Etsy shop, ShoutRinse. She's got a lovely selection of pinch bail earwires and bails. Alisa also has a shop devoted exclusively to Art Nouveau inspired pieces. That's where I saw this wonderfully whimsical magic mushroom pendant. I love his little face and traveling stick and basket, with what looks like a clover tucked under his arm. (The mushroom man also come in an adjustable ring!) This little buddy arrived in the mail today and I am utterly delighted with him. He reminds me of the creatures and mushrooms we used to sculpt as children out of polymer clay. Definitely check out Alisa's Etsy shop, AccoutrementNouveau. Lisa learned quite a bit this week about the need to clean beads if they have a powdery residue inside. Stop by if you have a chance for some safety tips. Who says jewelry tools are mainly for metalsmiths? There are plenty of cool tools and gadgets for beaders too! 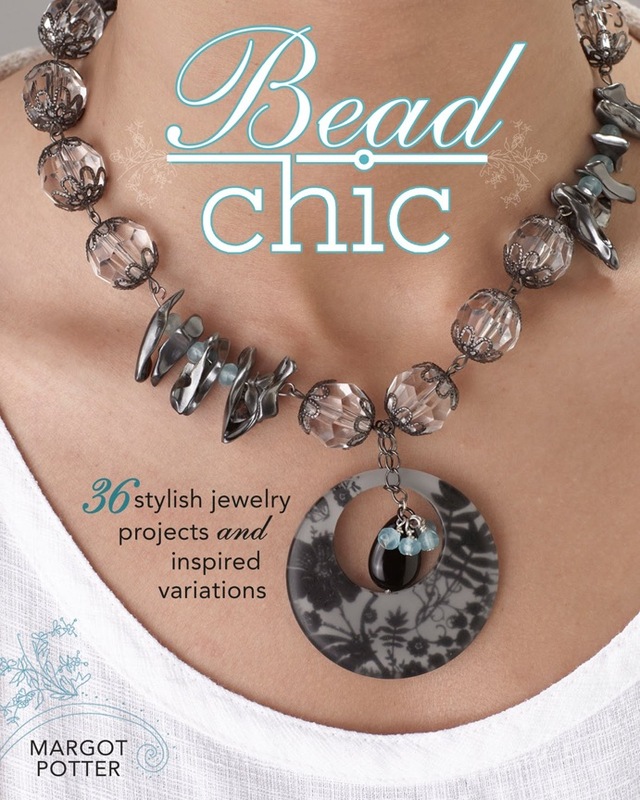 It's July and the Art Bead Scene has a new monthly challenge. Wondering what the prizes are for this month? Come check them out! Barbe Saint John - New Jewelry from Forgotten Artifacts As she gathers inventory for her show, Barbe wonders why no one buys bracelets these days. Carmi makes a new necklace featuring the funniest artwork images! The schedule has been crazy and the studio is in disarray. Cindy is going to take back her workspace by....brace yourself.....cleaning! Summertime is the inspiration for a new necklace using glass flowers from Artbeads.com and Earthenwood Studio birdie and lumber themed components. Jean is thrilled that Margot Potter's latest oeuvre, Bead Chic, is already available at Amazon! 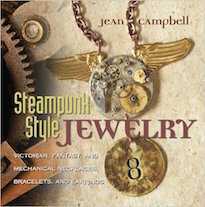 This is a super concept for a jewelry design book, and Jean will explain why! Andrew creates a necklace called, "The Keeper of Memory" around one of Anne Choi's sterling silver beads. You couldn't ask for a nicer Sunday. It started off right with a darkly brewed pot of coffee. I like to make my coffee strong and then add lots of milk and sugar, so that it's like the café con leche I used to get at the bodega around the corner from my old apartment. While the dew was still clinging to the grass blades, we went outside and picked some vegetables and herbs from the garden. I marveled at all the growing things. My toad lilies have buds. The peonies I just got are already bursting out of their pots and are budding. Soon they'll need to be planted in the ground. The marigolds have little baby plants popping up all around their bases. My mother taught me to break off the brown and withering heads and stick them around the plants. "This one makes the babies." My little cats sat at my feet while I chopped the vegetables and whisked the eggs for a frittata. I used the Amish cheese we got from down the road. I remember waking up early on Sunday mornings, when everything and everyone else was still sleeping and making this for my roommates. I didn't grow the vegetables then – they were small things purchased at the corner store probably grown in a hothouse in the Wilds of New Jersey. The windows are still open and a breeze is coming through. It smells like freshly cut grass, mint, and wood. I have all my albums by Sigur Ros on repeat. They are the soundtrack for this lovely Sunday. Yesterday it rained off and on. Despite the weather, I was an instrument of efficiency. I got a ton of housework done and even managed to do some gardening and make a cheesecake. I finished long waiting projects, like finishing drilling holes in the bottoms of ceramic pots (that I bought in Tucson when I was there last in February) for my succulent collection. I crossed a lot of stuff off my list. While I was cleaning, I was thinking about a lot of friends I haven't seen for awhile. I was still thinking of them today and was making plans in my head for a picnic or a small adventure. I picked up my phone and started to look up one of my friend's phone numbers. Then it struck me, "Oh yeah, they live in New York." My fantasies of an impromptu adventure quickly fizzled. I haven't minded the solitude of country life. Sure, when I first moved here it was hard, but I eventually grew into the daily routines and truly enjoy the space and fresh air. I feel as though I've grown into myself here. Distractions like the kittens (who are now little cats) and the garden have filled huge holes in my heart. There are days though when I miss my own friends and family. I miss the dinner parties and the picnics and thinly veiled excuses to get together. I miss being able to call up one of my friends and within the hour have someone to hang out with. I miss rooftop barbecues and endless pitchers of sangria. I miss conversations over coffee and lunches at cafes and drinks at the local hangout. I think there's only so much missing a person can do before their brain starts to burn. My head started to pound. Soon I thought of nothing but the cool darkness and the two warm bodies pressed against me. Every now and then a concerned sniff or a curious meow. I'm better now, but there is a faint echo of each, I'd write more, but there is so much to be done. I'm preparing my shop for a massive update. I'll be carrying LOTS of new goodies. Unfortunately, my shop is limited to 100 items. Please help me make room for all the new treasures. 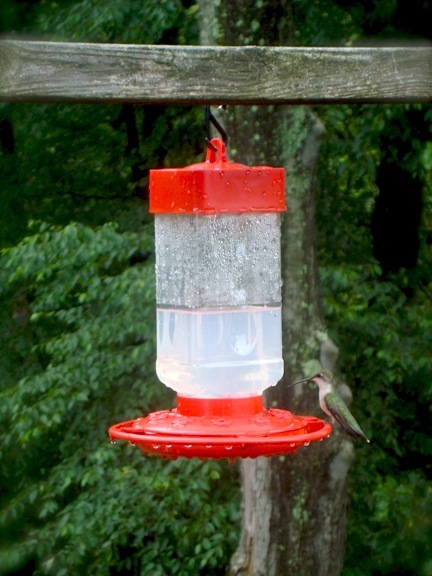 To help you help me, I've already reduced prices on some of the items and you'll receive 15% off everything in the shop with the coupon code "HUMMINGBIRD". Complementary gift goes out with every purchase made this weekend. These pre-dawn hours are sometimes my favorite. 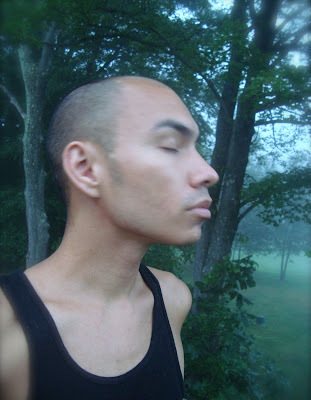 There are days when I luxuriate in the mist that has yet to burn off and is still cottony thick. I revel in the stillness. Everything seems emerald. The only sounds are the early morning bird songs, the purr of hummingbird wings, and the sound of my own heart. Everything seems possible. The day has not truly begun, but sings of what may come – what may be. I stand in the quiet that is not quiet and whisper, "Welcome." I wanted to take this opportunity to say, "Thank you!" So rarely do we get the opportunity to express our gratitude for the blessings in our lives. I wish that I had shown my appreciation a little more, especially towards those who are no longer with us. I would have said, "You make my life better by being in it." Each moment is a treasure. If anything I've learned, it's that time is precious and we should cherish what we have. Thank you. Thank you! THANK YOU! The auction of the necklace I made in honor of my friend, Amelia Geocos, is now closed. Her mom, Marian, placed the winning bid. It feels right that the necklace should go to her. Amelia was an incredible person and I think that her upbringing played a big part of that. I am grateful to her for raising such an amazing person. My life was better for having Amelia in it. I am a better person for having known her. I also wanted to thank everyone who bid and did not win, to everyone who donated to the Memorial scholarship, to everyone who sent a kind note, and to everyone who passed the word along. I appreciate your support and your help in allowing me to honor my friend. Thank you! I watched the sun set today. I took a moment to remember my friend. I said THANK YOU to the wind, to the sun, to the green of the grass and the fading pink of the sky in hopes that she heard me and knows what an impact she left on me. Please, take a moment and say THANK YOU to those that you love and care for. Each moment is precious. This week, one lucky winner will take home the prize of a beaded brooch from Oregon-based beader and gardener, Cenya of the Emerald Window. Cenya has embellished a floral-themed, stamped brass filigree with a mix of luscious seed beads and sparkling Swarovski crystal dangles. Be sure to check out her blog and her Etsy shop for more examples of her work. 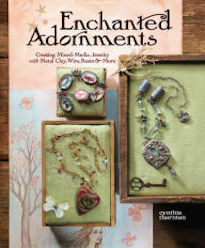 To enter to win this lovely beaded brooch is easy! All you have to do is comment on this blog post. One lucky winner will be randomly selected from the comment section of this blog post on Monday, (July 19th) at midnight EST. Make sure to leave your name if it doesn't already appear next to your comment for easy verification. This giveaway is open to all participants, including international readers. Bonus Points: You can earn extra chances of winning this beautiful brooch by blogging, updating your Facebook page, and/or Twittering about this Thursday Giveaway. Don't forget to add your act of social media kindness as a separate comment for your additional entry to win! Extra Bonus Points: Become a follower of the Emerald Window and leave a comment here afterwards. Becoming a follower is simple. Find the widget on her sidebar and click, "Follow". Don't forget to add an additional comment for your extra chance to win! I recently discovered Giveaway Scout and have been having fun entering all kinds of giveaways! It's a free search engine that focuses only on giveaways. You never know what you're in for; they scan thousands of blogs and feature giveaways of everything from organic bread, to free shoe insoles. If you'd like to play along also, you can check out their WEBSITE or you can check out the widget on my sidebar. It's a fun and easy way to win free stuff! 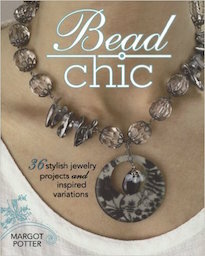 Margot Potter, talented designer and prolific author, recently debuted her new book, Bead Chic. The book has 36 beautiful step-by-step patterns and strongly encourages personal exploration by offering up variations of each of the projects. Some of the top designers in the field have tackled the variations (including yours truly)! Keep an eye out for my full review and a book giveaway! For dinner tonight, I made a flank steak rollatini with caramelized, wine-braised pears. To make the rollatini, I pounded out the flank steak into one large, flat piece. While I was hammering away, I placed sage leaves and seasonings so that the meat would be very flavorful – literally pounded in each bite. I then made a pate of sauteed mushrooms, caramelized onions, chicken livers, and crispy bacon. This mixture was spread liberally over the pounded flank steak. I rolled it up and then wrapped it in bacon. Flank steak can be dry and chewy if overcooked, so the bacon helped keep things nice and juicy. I laid the bundle over the pears and the wine sauce. The pears added sweetness, as well as elevated the wrap so that it would cook evenly and allow excess bacon fat to drip off. This was baked in a covered dish until the very end, when I removed the cover and turned the broiler on to get the external bacon crispy with a nice dark coloring. I let the rollatini sit before slicing it, so that the juices could redistribute themselves. Here's the first harvest from the garden. Lots of cucumbers, kohlrabi, lettuce and strawberries. We got one tomato so far, but I expect lots more later in the season. (My fingers are crossed that the Tomato Blight stays far, far away!) The herb garden is doing well also. I'm puzzled what to do with so much parsley. There's only so much tabbouleh I can make. The mint is going crazy and I think we might need to have a Mojito party. Perhaps sensing my need for a pick-me-up, the delightful Sue of SueBeads sent along a care package. She's so thoughtful. She sent some of her silver-studded lampwork beads and the new enameled lampwork beads she's been working on. Aren't they lovely? The highlight of the show was running into Gina Marie Chalfant of White Swan Illuminations. I met Gina several years ago at the first officially bead show I did in Pittsburgh. First and foremost, she's an incredibly thoughtful and extremely nice person. I always enjoy seeing her and her daughter. 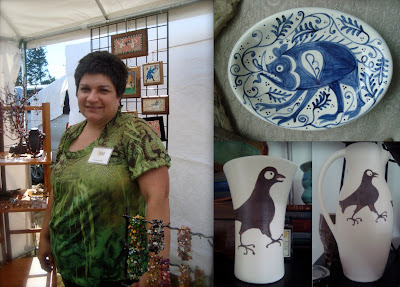 Gina is also a supremely talented ceramist, jeweler, and Renaissance woman extraordinaire! I've seen some of her pieces over the years, but I've never seen the full spread. I'm utterly smitten by her work. It was delightful to see the range of her artistry and interesting to hear about their inspirations behind the pieces. For instance, the raven vase and pitcher were inspired by a 14th century Italian motif and the razorback dish was derived from a fusion of mid-14th and 15th century Spanish designs. Did I mention that I absolutely adore her work? Seeing her and acquiring the three pieces was the highlight of the weekend! On our way home, I saw a Ghost Bike near the ramp to get on the highway. It was a sad reminder of my friend, Amelia, and the anniversary of her passing. It was strange to come across this shrine, especially on that particular day. It seemed like a sign. I didn't know who this Ghost Bike memorialized, but I wanted to find out. I wanted to pay my respects. The Ghost Bike in Boalsburg was erected in honor of Dr. Bohdan Kulakowski. He was a professor of mechanical engineering at Pennsylvania State University. He died in March of 2006. The winner for this past week's Thursday Giveaway is Diana P. of Suburban Girl Studio. Congratulations! Please email me with your contact information and I'll put your prize in the post. Be on the look out on Thursday for another chance to win! Anne Choi recently updated her catalogue with a new mandrake bead with an ouroboros. On it is an ee cummings quote. It reads, "(when time from time shall set us free) forgetting me, remember me." In her update, she describes some of the interpretations and symbolisms behind the imagery. She also wrote about how she was curious to hear what others thought of it. I've been thinking about this a lot. So much so, that I got up in the middle of the night and started to work on this piece. I couldn't sleep. As I wire-wrapped and pieced the necklace together, I pondered the bead and its meaning. To me, I think of memory as an ocean of thought, streaming back to the dawn of civilization and the first utterance of word. It is infinite. I see it symbolized as the serpent that swallows its own tail, much like our very DNA, coiled and twined unto itself in a spiraling double helix. It's a powerful force, that no single mortal can wield. A mandrake, symbol of magic and mystery brandishes the ouroboros. It is the Keeper of Memory. To me, it tells a story about the incarnations of knowledge and wisdom and the path of enlightenment, the way of the magician. The necklace I made is composed of garnets, carnelians, cranberry pearls, "velvet ruby quartz", Swarovski crystals, ceramic from Keith O' Connor, and raspberry jade. I also included a large dichroic glass bead from my collection with the oxidized silver handmade chain and wire. As a clasp, I used a toggle from my family. I love all the textures and the vibrant colors. 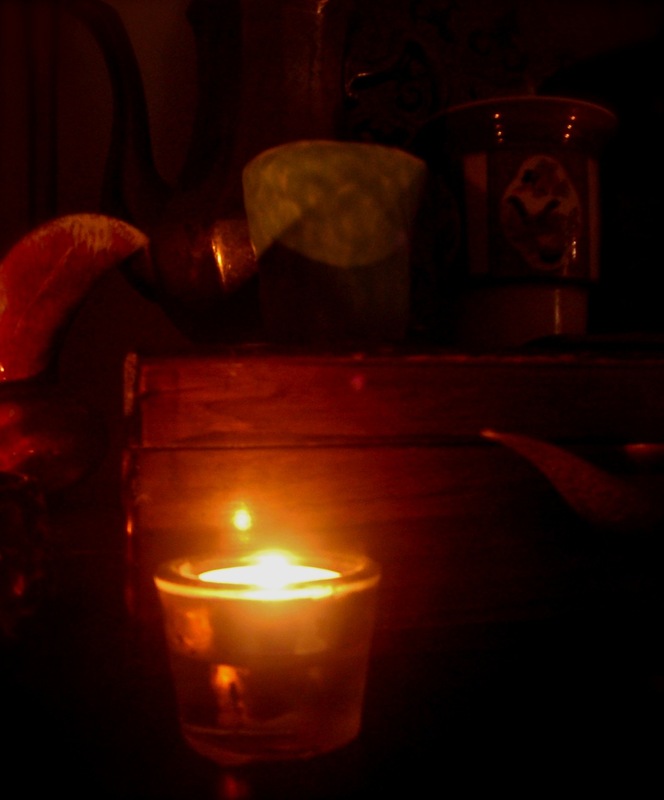 I light a candle against the dark. I wasn't sure if I was going to post a self-portrait this week. I've been in a pensive mood lately. I've been trying for the past hour to write just what I mean, to capture the feeling exactly. Some days the words flow easily. Today is not one of those days. I wrote about storm clouds. I wrote about being drunk on dreams and memory. I wrote about remembrance and feeling shipwrecked and landlocked. Each line I write seems to fall short of being just right. On July 11th, 2008, my friend Amelia Geocos was tragically killed in an accident. She was riding her bike and was struck by a minivan. Her life was cut short at 24 years old. Amelia was a bright star shining with potential. 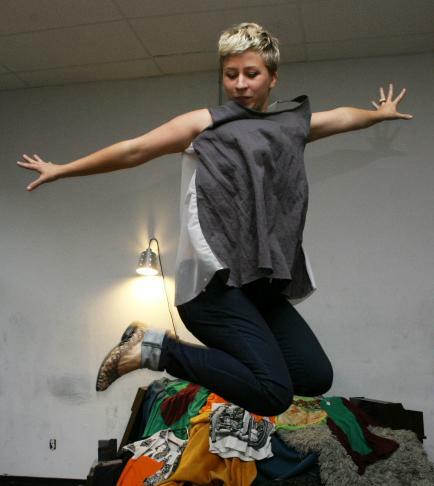 She had the energy and vitality of ten people and radiated warmth, humor, and compassion. I think about Amelia often. I don't think there's a time that I've gotten behind the wheel that I haven't briefly touched on her memory. I try to remember her lust for life though, instead of her senseless death. Mostly I remember her laughter. It was infectious and ringing. I also think about her work as an artist and her daring. She was fearless in her creating. She was not afraid of learning new things and working hard to make her ideas come to life. She'd dance, sew, paint... whatever it took to say what she wanted to say. When I lived in New York, I used to visit the site of the accident. They had erected a memorial, a Ghost Bike. I would go there usually in the early morning, when it was quiet and fewer people were about. When I went, I felt closer to her. Sometimes I'd leave notes. Sometimes I'd leave flowers. Sometimes I'd leave mardi gras beads. I would leave tribute to my friend. I'm miles and miles away from there now, but I still want to leave tribute. I thought that I'd make a donation to the memorial scholarship set up in her honor at our old alum. I'm far from rich though. So, I decided to make a piece and auction it off here on the blog. Every penny that the necklace generates will go directly to the scholarship fund and hopefully make attending art school a little bit more affordable and easier for a student who was just like us, trying to make their dreams come true. I wish that I could do more to say how grateful and appreciative I am of having had the opportunity to call Amelia my friend. I call the piece, "One in a Million". Amelia jokingly used to say that she was, "One in Amelia!" I brought out some of my best beads for this piece. It is made up of labradorite, cyanite, aquamarine, sapphires, chalcedony, faceted pearls, and tourmaline. I also used a dichroic glass bead. With those, I incorporated silver chain (some that I made myself) and a toggle from my family. The focal is made out of fine silver. It's one of a kind. My fingerprints are on the back. I made it before the memorial ride and walk that happened back in January 2009. I've carried it in my pocket, off and on, since then. 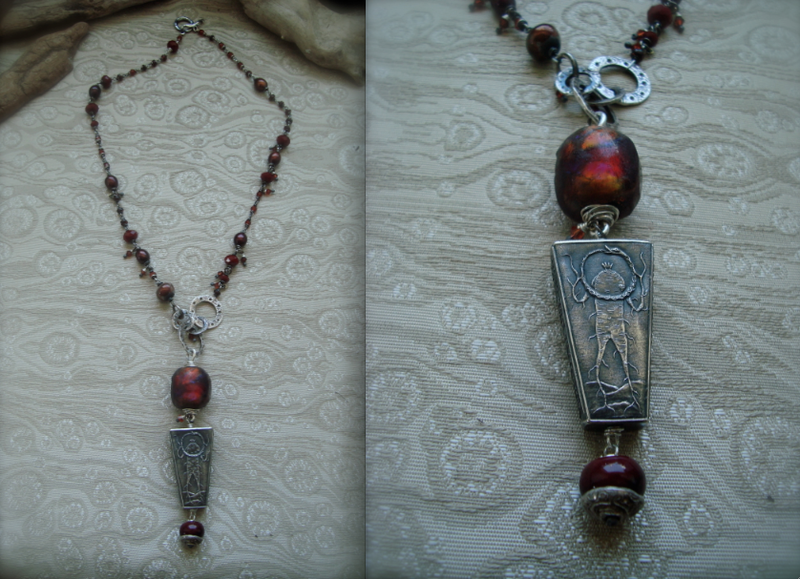 It's a long necklace; it measures 30" long. While I made it, I thought of all the fun times we shared and how we used to talk, laugh, and even dance for hours. The auction starts today, July 8th, 2010. Bidding will last for one week, until midnight July 15th, 2010. To place a bid, leave a comment on this post. Be sure to post the dollar amount of your bid and to check the previous comments for the highest bid. Be sure to also leave either your email address or another form of contact information. Bidding starts at $50. This week, one lucky winner will claim the prize of a sterling silver mermaid pendant by Florida-based author and designer, Tammy Powely. 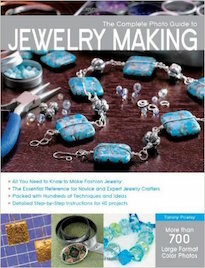 You might know Tammy, the Crafty Princess, from her many books like, Making Designer Gemstone and Pearl Jewelry and Picture Yourself Creating Metal Clay Jewelry, or her popular About.com: Jewelry Making blog. 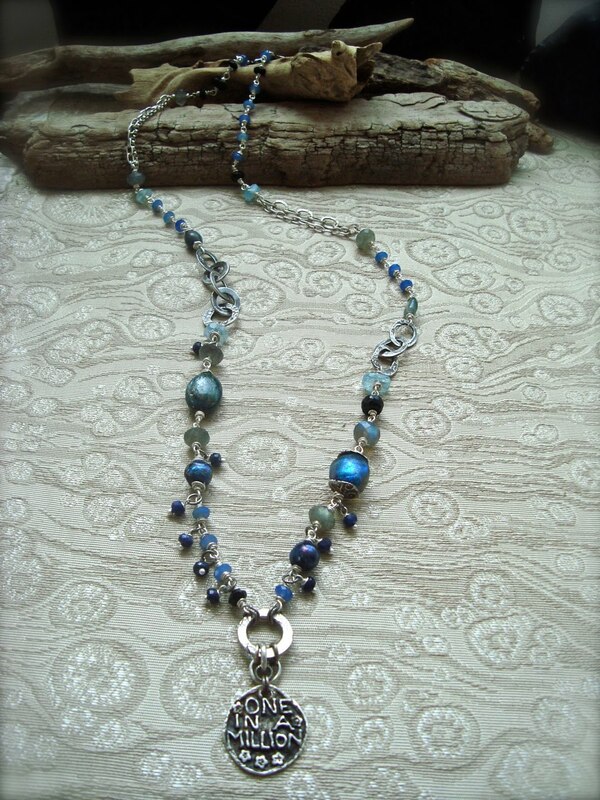 This stunning pendant (including a soldered jump ring for easy wearing) comes courtesy of Tammy and her online shops. Be sure to check out her Etsy shop and Efreeme shop for more lost wax castings, various jewelry components, kits, tutorials, and finished jewelry. To enter to win this lovely pendant, all you have to do is comment on this blog post. One lucky winner will be randomly selected from the comment section of this blog post on Monday,(July 12th) at midnight EST. Make sure to leave your name if it doesn't already appear next to your comment for easy verification. This giveaway is open to all participants, including international readers. 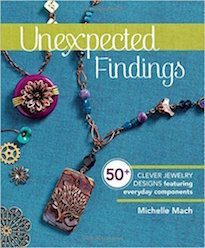 Bonus Points: Earn an extra chance of winning this beautiful pendant by blogging, updating your Facebook page, and/or Twittering about this Thursday Giveaway. Don't forget to add your act of social media kindness as a separate comment for your additional entry to count! As I stretch my vision across the rolling acres unfurling before me, counting my human interactions for the day on a single hand, and soaking in the undisturbed solitude of country-living, it's hard to see myself as anything but an island. 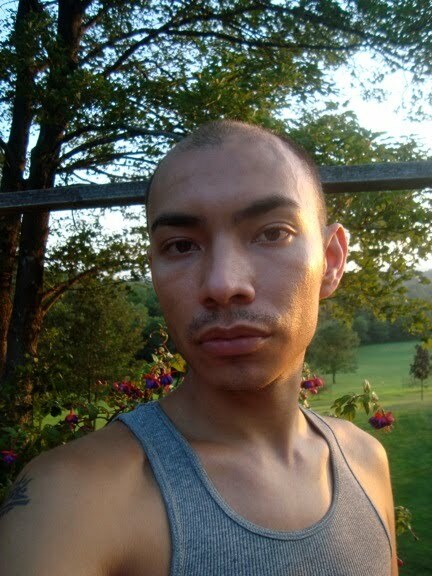 When I did live on an actual island, it was hard to see myself as such. I was surrounded by millions of people at any given moment, all colliding into each other. Sure, we were insulated by our own personal bubbles, our agendas, priorities and errands, but we were all there together in the sea of faces and people. Living in the City felt like stew – although distinguishable chunks remained of each ingredient, the unifying broth made of a slurry of worn down edges and extracted flavors permeated all, leaving only internal kernels of absolutes. As I examine my tucked away life, it would be easy to continue feeling like an island. It would be easy to see the surrounding hills and trees as impassible waves, a dividing separator. The illusion might be considered complete, except for spider silk threads extending out in every direction. This one is called family. This one is called friendship. This one is called career. It takes a certain light to reveal each connective fiber, building unseen bridges and web-like constructions. Looking closer – deeper – it's easy to see that I am surrounded by these shimmering, fragile ribbons. My island is an archipelago. It's quickly becoming a scorcher out there. The past few days, the temperature has skyrocketed! It is so hot out that the tar in the road started melting and sticking to the tires. 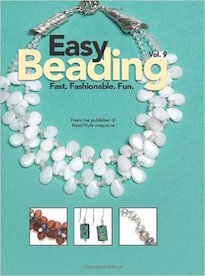 If you're looking for something to do while you attempt to avoid the heat and humidity, why not check out the recent beading magazines from Interweave Press? 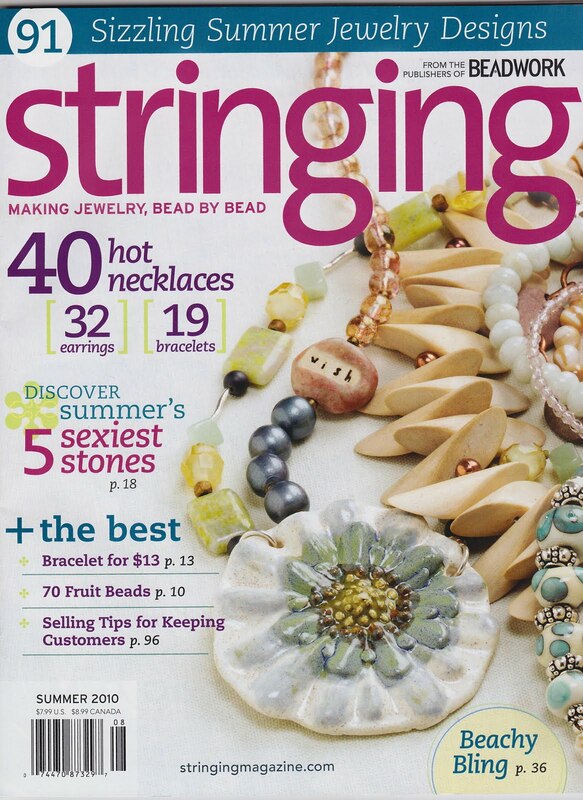 The summer issue of Stringing magazine hit the stands a few weeks ago and the new issue of Creative Jewelry came out in advanced copies last week. Both of them are FULL of inspiration! (I'm particularly fond of Melissa J. Lee's unique use of peppercorns in one of her designs.) So escape the heat and cool down with some hot designs!